We bring a set of philosophical dance concepts and an ‘attitude’ with us, when we walk onto the dance floor. When two opposing core values and dance concepts clash on the dance floor, we experience the dancing as incompatible. There are a number of dance styles in Argentinian tango. In their pure form they are mutually incompatible, unique and special. In my video, Queer Tango And The Other Dance Styles in Argentinian Tango (2016), I argued that Queer Tango is the latest dance style in a long line of dance styles in Argentinian tango. In this manifesto I propose 10 best practice dogme rules as a ‘vow of chastity’ and as a set of creative constraints for the dance style of Queer Tango. 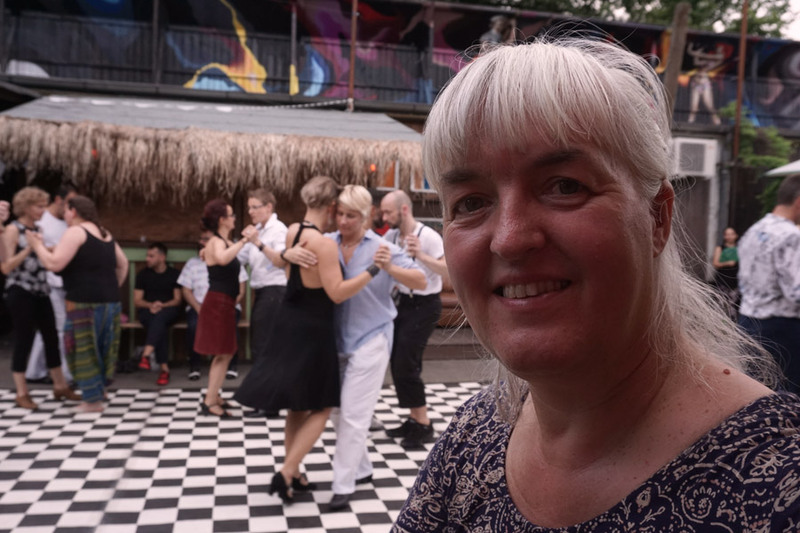 My 10 dogme rules consist of six Queer Tango concepts (rule 1-6) and four appropriated concepts from mainstream tango for the dance style of Queer Tango (rule 7-10). We love the concept of ‘fluid roles’ in Queer Tango. We will not argue for our limitations or fight for the right to dance one role more than the other, when we dance the dance style of Queer Tango. We will learn to dance both roles, because we interpret the concept of ‘fluid roles’ in Queer Tango by dancing ‘intercambio’, changing roles while we are dancing a tango. We will break the norm of the heteronormative gender specific roles of mainstream tango, turning the roles fluid by dancing ‘intercambio’. We have the freedom to dance with anybody, who sends us a smile, regardless of their genders. As dual role dancer we will learn to improvise from both positions. We will ‘follow while leading and lead while following’, sharing the labour of leading. And as a courtesy to our Queer Tango dance partners, we give the dancer starting in the position of ‘leader’ the opportunity to end their dance as the ‘follower’. We accept that tango was designed as a macho/heteronormative dance and we will empower the ‘follower’ in ourselves by applying strategies to our Queer Tangos, such as the follower initiating a change of positions or ‘backleading’ to better this flaw. We will dance Queer Tango, Queer Milonga, Queer Tango Vals, Queer Tango Nuevo, Queer Tango Milonguero, etc., applying the dogme rules to all the dances and dance styles in tango. No tango without a good measure of ‘contact’. We will create a good ‘contact’ with all our dance partners, as we love the feeling of a yummy embrace. 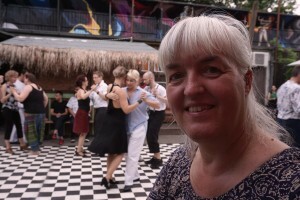 We consider the following to be bad technique: to carry, push, pull or manipulate our dance partner; to break the flow of a tango before the melody has ended; to ‘fall’ into our steps, etc. While leading we will be alert and flexible, because we must ‘follow our follower’, accepting their moves as the starting points of our next steps, always improvising our dances in harmony with our dance partners. We love tango music and will not just ‘execute steps’, but aim at developing our musicality so that we embody the different rhythms and voices of a tango. This is where we show off and present our skills as dual role dancers. When dancing the dance style of Queer Tango, we will dance in harmony with the flow of the other tango couples (in our lane) on the dance floor, i.e. we will not create ripples of chaos on the dance floor by taking up too much space or by shifting between the different lanes. We do not dance our Queer Tangos, zig-zagging on the dance floor. We dance supporting harmony on the dance floor.